The entrée.DSR software module is a tried and true application which has been used for many years by food distributors DSRs (Distributor Sales Representatives) to place orders remotely, as well as other sales tools. It is designed to run on a standard Windows based laptop computer. The purpose behind the creation of entrée.DSR, was to provide an extension of your entrée software, which would run remotely on a laptop (or even a desktop) computer to give your DSR’s the tools they need, without having to be constantly connected to your company’s server. Note that our Electronic Order Pad application for the iPad and Android tablets was created to take the place of entrée.DSR for those food distributors looking to utilize the latest in technology and features for their sales force. Please visit the Electronic Order Pad page for more information. The appeal of entrée.DSR is that it provides an extension of the data from your main entrée system that your DSRs need to deal with customers and place orders, without actually being connected. There are many features and controls which you can enable or disable per DSR. This includes the viewing of inventory costs (Real, Base, Landed or Market) and profit margins, entering catch weights, requesting specific inventory lots, editing pricing and the ability to establish pricing below your defined "Minimum Sell Price". A DSR can also be defined as a "Sales Manager" which means they are provided all customer information, and not just their own. The entrée.DSR software communicates directly with the server in your office running entrée for either downloading important data (such as inventory, accounts receivable, etc.) or transmitting customer orders, quotations, etc. It handles the communication by VPN (using an Internet connection), a direct connection to your network (in those instances when the DSR is in your office with their laptop) or a modem using a standard phone line, cell plan or wireless air card. All of the work accomplished by the DSR is stored locally on their laptop, and is transmitted when the DSR initiates a data transfer. 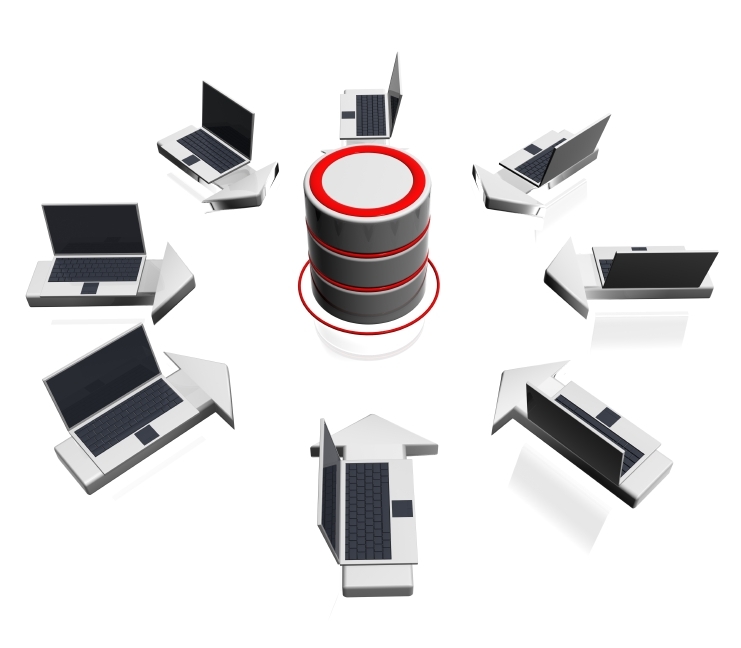 A designated workstation in your office can be put into "DSR Host Mode" where it waits to service remote requests from the DSRs, including uploading and downloading specific data including customer orders, inventory levels, costs, pricing, items, accounts receivable, credit hold customers, etc. Most food distributors using entrée.DSR have their sales force receive at least one data transmission a day to update all the data on the DSR's laptop so that your DSR's can place orders with accurate information. Your DSR's will be able to quickly create customer orders while having access to a wealth of information about each customer's buying habits and past purchases. They can see if the customer is on credit hold, over their credit limit, or has any other accounts receivable issues that should be dealt with before placing a new order. If you allow, there is even a special hot key they can hit which will show them the orders profit margin by item and what their commission may be (out of the customers view). This allows them to make price changes and see the immediate results to the bottom line and their commission. 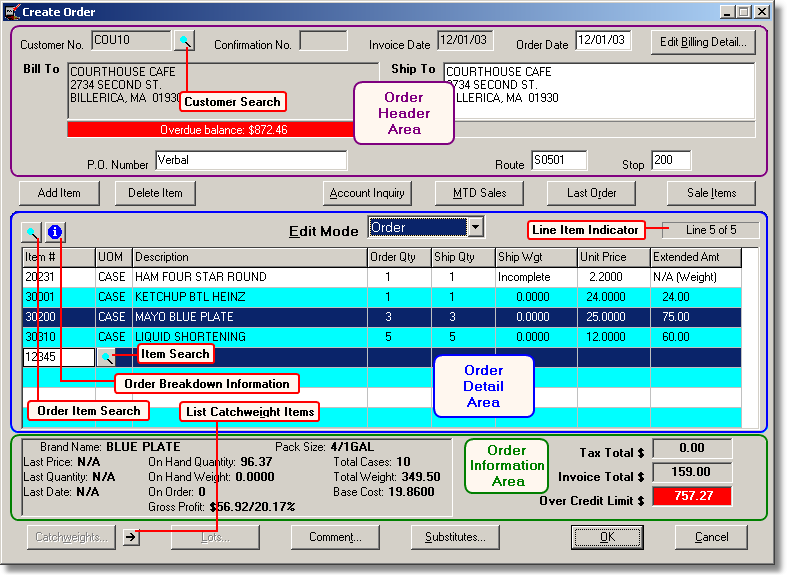 While creating an order, the Standard Order screen will display each of the items the customer regularly purchases and allow the DSR to quickly enter the quantity requested. Note that as each item is displayed, key information about that customers last purchase are shown, including last sale quantity, date and price. You can even set the order in which items appear, in case your customer prefers to order items in a specific sequence. The Customer Account Inquiry screen allows your DSR to quickly see a summary of a customer's account status. They can also view this information when creating or changing an order. All of the open invoices of a customer as well as the paid invoices of the current period are displayed. 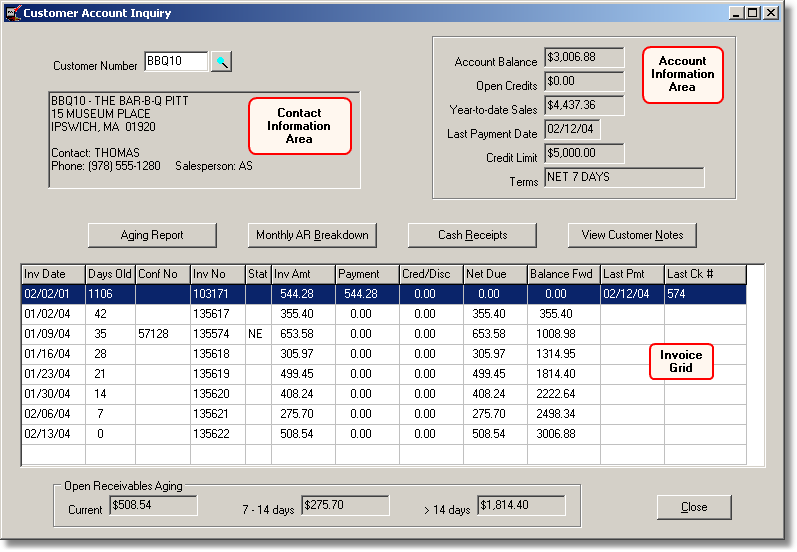 Besides clear and instant access to a customer's accounts receivable status, this screen also provides the ability to display MTD/YTD sales, detailed cash receipts, customer notes and the ability to generate an Aging Report for the customer. After the DSR completes an order, a "Confirmation Number" will be assigned to the order, and they will be allowed to print an "Order Confirmation". 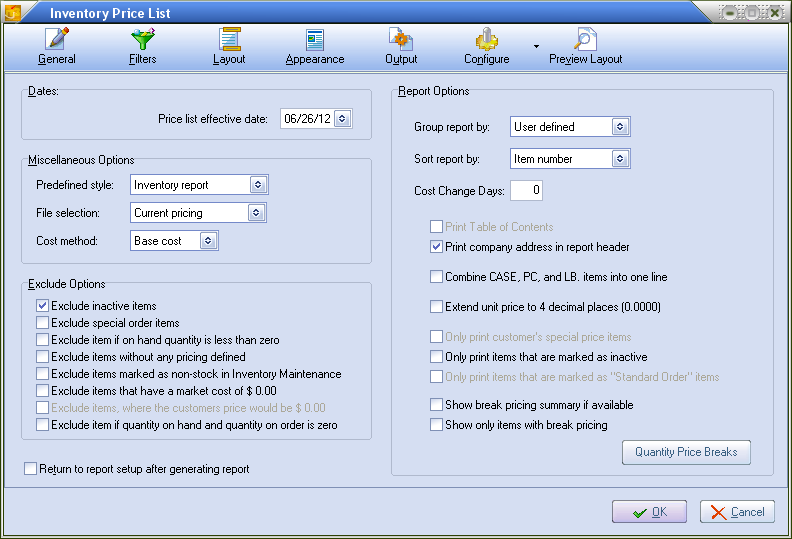 This document will show the customer all of the items that have been ordered. You have the option of showing pricing as well as an Estimated Total. After this step, the order can be immediately transmitted to your main entrée server, or be saved to be transmitted at a later time when it will be assigned an actual Invoice Number. Your DSRs will love the many reports they can generate. All reports can be fully customized to provide control over data fields, data field order and filtering, as well as sorting and grouping on select fields. 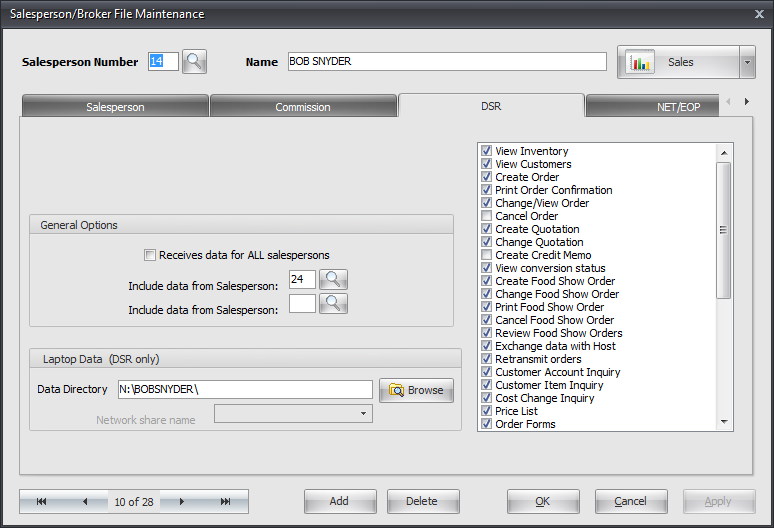 Multiple filters can be defined per report to give your DSRs the exact info they need. Included reports include the Price List, Order Register, Customer Mailing Labels, Customer Accounts Receivable, Customer Order Forms and many more.